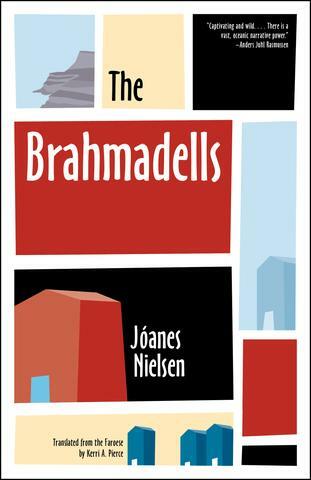 Jóanes Nielsen’s The Brahmadells is a sweeping novel that spans the start of the 1800s to the new millennium, chronicling the lives of a connected group of people residing in the port town, Tórshavn, the capital of the Faroe Islands. The novel follows the Geil family, nicknamed Brahmadella, along with their travails, loves, enemies, livelihoods, and downfalls through the generations. The history of Faroes forms the milieu for the characters’ dramas—the measles epidemic, the agitations for independence, and the anti-union violence. Sometimes characters are caught up in action, and other times important historical events remain merely background as Nielsen focuses on the individual. Family and history are the obvious themes in this book but a third current runs through, tying the other two together in a troubling fashion: “There is hardly any other country, or indeed any metropolis, in which mental diseases are so frequent in proportion to the number of people as on the Faroes.” Readers can trace the genealogy of madness within the Brahmadella clan, including the hot-tempered Nils Tvibur, the disturbed and accusatory Betta Geil, and the brutish Hjartvard—all culminating in the violent climax of the book. Here, in Jóanes Nielsen’s Faroe Islands, scars are a type of curse, and wounds inflicted can ripple outward to hurt people long after both perpetrator and victim have passed. And yet, far from being a pessimistic condemnation of human cruelty and the tyranny of blood, The Brahmadells provides readers with moments of compassion and tenderness, sometimes in surprising ways: a 19th century father refuses to forsake his homosexual son, a soldier saves a woman from assault at the hands of Danish officers, and a young boy with a medical disfigurement is taken in by a reclusive, sun-worshiping farmer. And The Brahmadells is exceptional in that few contemporary works of Faroese literature exist in English. Translator Kerri A. Pierce does a wonderful rendition of the almost saga-like tone of The Brahmadells, bringing the large, century-spanning cast of characters to life. An unforgettable masterpiece, one can only hope that this novel heralds a wellspring of translations from a land often overlooked. In recent decades, the translator’s footnotes have fallen vastly out of favor and now are considered distracting, unnecessary, pedantic, and imply a lack of trust in readership. In our age of smartphones and informational websites, the perceived need for them, for direct explanations of foreign nuance, has waned, but little has been said regarding the mighty footnote’s literary potential . . .
French author Brice Matthieussent seeks to correct this oversight with his novel, Revenge of the Translator. Through this experimental form, Matthieussent takes on the role of Trad, the translator of an American novel, Translator’s Revenge, which casts the tale of the disgruntled American translator, David Grey, and his attempts to translate French author Abel Prote’s latest novel. Quickly, the narration-via-footnote becomes so fed up with the original text—its misattributions, its overwrought prose, its misinformed assertions about the craft of translation—that Trad decides to edit and remove offending parts of the work, piece by piece, until all that remains is his mounting scathing commentary. “I reside here below this thin black bar,” the first note begins, inviting the reader into the translator’s humble, subterranean abode. From there we are taken into a benthic world of rebellion from below, an erudite realm whose keeper plots a novelistic subversion of literary tradition. Revenge of the Translator was translated from the French by Emma Ramadan, the well-deserved winner of the 2018 Albertine Prize for her English rendition of Anne Garréta’s Not One Day. One can obviously see the difficulties this book must present in translating it—the shifting allusions, the reliance on constant mutation of the phrase “translator’s note,” the inversion of French and English wordplay. One also wonders if the temptation existed for Ramadan to find novel ways to insert herself into the text, for certainly she shares in the glory of this book’s resounding artistic success. In fact, considering the content of this book, it is quite possible that Revenge of the Translator may find literary viability solely in its translated form, fulfilling the promise of providing a platform for all those who labor to bring a work onto the international stage. Like a child born with two heads, Roque Larraquy’s Comemadre, translated by Heather Cleary, comprises a bifurcation that appears both antagonistic and intimately bound. In the book’s first half, set in a sanatorium on the outskirts of Buenos Aires at the beginning of the 20th century, a doctor contemplates his awkward infatuation with the head nurse while, in an attempt to unravel a medical mystery, a group of scientists decapitate cancer patients under false pretenses. A hundred years later, the second-half concerns a child-prodigy, a young artist searching for a new project and discovering another person who looks almost identical to himself. Together, the duo travel to the same sanatorium in order to create a truly shocking work of art. By situating both beginning and end in the same locale, Comemadre creates a full circle of the grotesqueries humans inflict upon one another in pursuit of immortality. The characters are eerie and pathological—a freckled doctor obsessed with phrenology, a woman who wears shirts with the names of different countries to convey her current mood, a photophobic prostitute—and the atmosphere vacillates between absurd and horrific, creating a sense of unease that permeates the text. Read Larraquy to experience a strange waking dream from which there is no escape. The eponymous Lichter of the 1969 Romanian novel The Life and Opinions of Zacharias Lichter, by Matei Calinescu, translated by Adriana Calinescu and Breon Mitchell, would look poorly on the very concept of a book review. This shabby, wild-eyed, Zarathustra of the streets is filled with the sublime fire of the Lord’s angels. He wishes to turn the world upside-down; to excoriate utility, reason, and possession; uplift perplexity; praise the holiness of beggars, alcoholics, the blind and the infirm (physically or mentally so—ideally both at once); and scorn the very act of writing in favor of the spoken word. “The one-who-speaks requires a spiritual energy and a continuity of creative tension that may be lacking, and often is, in the one-who-writes.” And even then, he is only in favor of divinely inspired spoken words—how would such a person react to a book review, especially one of his own biography? The Life and Opinions is framed as a series of Sudelbuch-esque fragments compiled by Lichter’s anonymous biographer. It contains poems fished out of trashcans, diatribes against psychoanalysis, Lichter’s brief history, anecdotes and anti-picaresques, a mapping of his spiritual metaphysics, and his ranting opinions on everything in the world—mathematics, the elderly, comfort, suicide. . . The text is short yet comprehensive, giving the reader a full picture of a man who reflects Witold Gombrowicz, Pierre Menard, Maria Sudayeva, a thousand eccentrics and iconoclasts whose minds alight with luminous messages for a tainted and fallen world. Calinescu’s Zacharias Lichter is the abyss gazing back into us and our souls are better for it.